When they first formed in 2011, LA-based band Run River North dubbed themselves Monsters Calling Home. 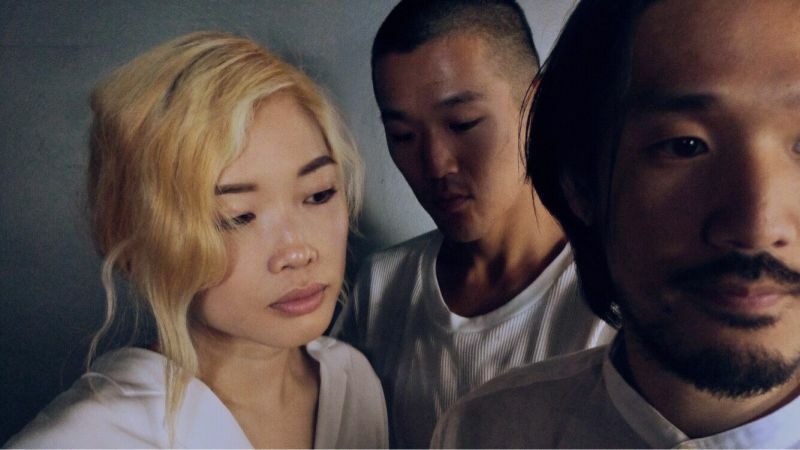 Eight years later, the trio of Alex Hwang (guitar/vocals), Daniel Chae (guitar/vocals) and Sally Kang (keys/vocals) have returned to the name — this time as the title of their upcoming EP, “Monsters Calling Home: Part One,” out in May 2019. A celebratory effort ushering in a new era for the band, after having recently evolved from a sextet to a trio, “Monsters Calling Home: Part One” is about finding hope in transition, discovering your voice in a sea of doubt, and deciding to dance despite sadness. “It’s learning to trust your own voice regardless of whatever's happening outside of you,” Chae says. Not just an Asian-American band or a group that relies on a set sonic formula, the EP continues to expand upon the band’s prior folk-leaning backbone. On lead single “Hands Up,” the band is at their most bombastic. The result of a co-writing collaboration with Hannah Hooper and Christian Zucconi of Grouplove — the duo’s first of such sessions — “Hands Up” pairs an earworm-y chorus with a front-and-center guitar melody, a second voice among Hwang’s lead bellow. Overall, the group utilizes more drum programming, dreamy synth, and dynamic production — a more expansive sonic palette. “Monsters Calling Home: Part One” is bookended by brother-sister songs “Casina” and “Casino.” A song with roots in the band’s days as a six-piece, “Casino” was written as the group’s former members began to phase out. A wistful and rustic intro builds into a walloping chorus: “I’m stuck in this casino / not much left for me.” It’s a song which serves as catharsis when reckoning with the forces that hold us down, a song inspired by Hwang’s mother’s cancer diagnosis. “At the time it was this big middle finger to cancer or anything you felt was giving an absolute statement to people’s lives,” he says. “Casina,” on the other hand, was borne out of a late-night studio session between Chae, Kang and their producer, Miro Markie. Aiming to re-work “Casino,” “they handed me a microphone and they were like, ‘Try singing,’” Kang remembers. Her take on the song’s chorus added an air of whimsy balancing Hwang’s belt. The pair ping-pong verses and lines, creating a push-pull of dizzying tension. “I think this may be the first song that we don’t have a lead vocalist in a song,” Chae says. “When Sally wrote her part on this song it was the first time we thought this might be something. That’s the moment I can point to that was really exciting for this EP. It’s a linchpin for this EP.